Jeremy Corbyn badge in red and white to support the new labour leader. 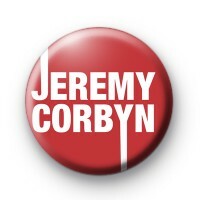 If you feel it's time for a change in British politics and feel Jeremy Corbyn is a better prospect as Prime Minister for a decent & fair Britain, why not grab a badge and show your support For The Many Not The Few. Help make politics in Britain fair for everyone & wear your Labour party support badge. Standard 25mm button badge handmade in our UK workshop.